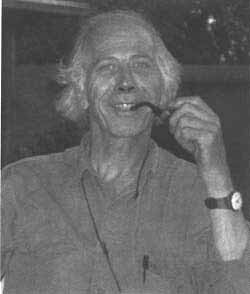 This page is dedicated for the memory of professor Paul Feltz (deceased January 23rd, 1996). The following is an article which I have scanned from TINS. For many of us - on both sides of the Channel, and that wider channel the Atlantic - who knew Paul Feltz and valued his friendship, the news of his recent death was perhaps not surprising: his parlous state of health was no secret. Nevertheless it was a great shock to lose someone who should have been in the prime of life, and had so much more to give to his family, as well as collegues and students at the University Louis Pasteur, in Strasbourg. Did Paul consider himself primarily a neuroscientist, neurophysiologist, biologist, pharmacologist or lately a molecular biologist? He was all of these, and a great deal more. Blessed with an all-encompassing curiosity, he had a vast capacity and enthusiasm for acquiring and assimilating knowledge of all kinds. This he used to good purpose, in a rich and a fruitful carreer both in teaching and research. A native of the easternmost periphery of France - he was born in Munster (Alsace) on 8 January 1942 - he proved an exceptional student: by 1962, he had reached the very pinnacle of the French educational system, the Paris Ecole Normale Superieure, for which the rue d'Ulm is famous. During his four years at the Ecole Normale, he obtained his University of Paris License (roughly equivalent to a BSc) in Biological Sciences (1964) and started research in neurophysiology at the Institut Marey, under the direction of Madame Albe-Fessard. Originally the home of the eminent physiologist Marey (who pioneered the use of photography for analysing human and animal locomotion) though situated in the Bois de Boulogne, far from the principal centres of learning in or near the Quartier Latin, this remarkable institute was the cradle of the post-war renaissance of French neurophysiology, inspired by Alfred Fessard and his wife. mosr of the current leaders of French neuroscience were trained there, including P. Asher, Y. Ben-Ari, J. Glowinski and H. Korn. The stately building has disappeared to provide more space for the adjoining ( and better-known) Rolland Garos Tennis Club. For the first decade, Paul Feltz's research was focused on the striatum, especially role of dopamine and the nigral projection. A painstaking electrophysiological analysis of single-unit response was combined with measurements of dopamine release ( the latter in collaboration with Marie-Joe Besson and J. Glowinski). It is summarized in a vast thesis for which he was awarded the Doctorat d'Etat in 1975. During this period, Paul also passed ultimate hurdle, the formidable Agregation examination that established him as a university teacher (1967). After an unrewarding, but fortunately brief, spell in the military, he came to Montreal in 1970, together with his wife Anne (an equally distinguished neuroscientist), to spend two years at McGill University. Having lived through the riots of 1968, they were perturbed neither by the threat of bombs (for a while Montreal was in a state of siege) nor some outstanding blizzards. Both avid explorers, accustomed to roaming about Europe, they took to transcontinental travel in a VW camper with enthusiam. Paul was particularly attracted by iontophoresis as a tool for studying transmitter (especially dopamine activated) mechanisms in the striatum, which he further investigated in Montreal, parly in collaboration with J. de Champlain. Though he continued with this topic after his return to Paris, by the mid-1970s he came to feel that little more could be achieved in clarifying the role and precise mechanism of the action of dopamine (which remains surprisingly obscure even now). He therefore decided to work on 'simpler' preparations, that could be studied under favourable conditions in vitro: first, sensory cells in dorsal root and other ganglia; and later hypophyseal neuroendocrine cells. For some 12 years, GABA and related agents were the principal topic of his research. A great deal of interesting information was obtained on the effect of GABA (acting via GABAA and GABAB receptors) on nerve cells, axon and glia, the role of GABA uptake, and how internal Ca++ affects GABA receptors. Tests of new synthetic compounds revealed useful GABA agonists and antagonists. Though begun in Paris, this phase of Paul's research developed fully at the University Louis Pasteur, in Strasbourg, to which he and Anne moved in the summer of 1979. For Paul, this was something of a homecoming. He and his wife set up labs, respectively, in the Institut de Physiologie et Chimie Biologique (at the University) and in the CNRS-run Laboratoire d'Etude des Regulations Physiologiques. Applying his legendary enthusiasm, Paul took on multiple responsibilities of teaching undergraduates and graduates training thesis students and running a research lab. His lectures were renowed, not for their facile content, but for their challenging ideas and lively approach. The 10 doctoral students trained in electrophysiology in Strasbourg have all gone on to successful careers in academia and research. He became Director of the Institute in 1991. On arriving in Strasbourg, Paul pursued two key projects. First, he continued to analyse the contribution of GABA to presynaptic inhibition in dorsal-root and nodose ganglia. Using these models, he examined the properties and localization of GABA receptors on slow-conducting primary sensory fibers. Recording from the soma, he showed that baclofen inhibits the Ca++ component of the action potential. Second, as he was joining a laboratory centered on neuroendocrine studies, he chose to analyse signaling in the pars nervosa and in the pars intermedia of the hypophysis. With these models, he again displayed his capacity for innovation. As clasical intracellular recording was not feasible, he used ion-selective microelectrodes to follow changes in the extracellular concentrations of K+ and Ca++, and was thus able to detect the presence of both GABAA and GABAB receptors. Then he initiated a series of experiments in which biochemical and electrophysiological methods were applied in parallel to perfused explants and primary cultures of the intermediate-lobe cells. This multidisciplinary approach was directed onto the homogenous population of melanotrophs to dissect the transynaptic molecular mechanisms underlying stimulus-secretion coupling that leads to modulation of alpha-melanotroph stimulating hormone (alpha MSH) secretion. This model proved to be fruitful in other ways. Experiments with co-cultures led him to propose that hypophyseal factors can influence hypothalamic development, and it became the first model on which he applied the patch clamp technique. Indeed, working closely with his wife and their collegues at the Ecole Normale Superieure, Paul pioneered the use of this technique in France, first to look at chloride conductances in melanotrophs., and then at nicotinic and thyrotrophin releasing hormone (TRH) inputs. It was also on this model that he started the spectrophotometric studies on neurotransmitter modulation of cytoplasmic Ca++. With improved techniques, he re-addressed the problems of trans-synaptic regulation in more integrated models, CNS slices. In close collaboration with earlier students - who returned as tenured scientists - he combined patch-clamp and fluorimetric Ca++ measurement to study preganglionic neurons in spinal-cord slices. The major finding was the involvement of glycine, glutamate and nicotinic receptors in modulation of sympathetic function. Typically, Paul remained active, ever bright and optimistic throughout his short illness, fulfilling his research, teaching and administrative duties as director of the Institute. All who had the pleasure and the intellectual stimulus of working with Paul can only regret that someone so full of enthusiasm, ever-growing intellectual potential and so many humane qualities has died so prematurely.